To make sure we, as a species, love and take care of our offspring, evolution has hardwired us to be immediately attracted to anything small and adorable - we're genetic suckers for a big head and huge round eyes. 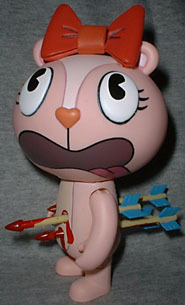 And really, they just don't come more adorable than those loveable skamps, the Happy Tree Friends. Shy and sweet, this little chipmunk's trademark is her bubbly personality and giggly attitude. You'll want to squeeze her to death! Aww, Giggles is a little cutie, isn't she? Look at her, smiling that big, buck-toothed grin at us, her face full of wide-eyed wonder. Awww! Her pink body is 4 3/8" tall, but her dandy red bow takes her up above the 4 1/2" mark. The figure moves at the neck, shoulders and hips - it's beyond minimal, but it works well enough for our purposes. I certainly wasn't expecting balljointed shoulders on a figure this size from a company like Stevenson. The paint apps are good, aided by the fact that even simple details like the stripe on her belly and her eyelashes are sculpted in. It helps that Giggles is a cartoon creation - the colors are supposed to be flat, so no worries about washes or dry brushing. 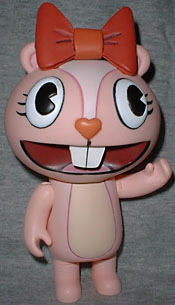 The majority of her body is pink, with a lighter version on her stomach and forehead and a darker tone on her heart-shaped nose. The sculpted lines do have a bit of a wash to make them stand out. Her mouth is underlined with black, and it's the same dark red used to shade her bow. Giggles has four accessories: some nicely detailed arrows. Why arrows? No idea. She-- oh, oh god! Oh god no! Somebody call a medic! If you don't know by now what the Happy Tree Friends are, they began life as a Flash-based web cartoon about cute little woodland animals who all meet a horribly grisly demise in each episode. Completely innocent activities like playing tennis, baking a cake or running with scissors all lead to terrible mutilation. Terrible, hilarious mutilation. As the official site describes it, the Happy Tree Friends aren't intended for small children or big babies. To that end, the HTF deluxe figures come in a two-pack with... themselves. Basically Giggles is packaged with extra replacement bodyparts - a new head and torso. The second torso has four bloody red holes running clear through, while the second head is decidedly less mirthful than the first: her eyes threaten to roll back in her head and her tongue is hanging out. The arrows fit nicely into the holes in her back. 2 3/8" long, the arrows are painted with the same bloody red detailing as the wounds. The holes are wider on her back than on her chest, which is how you can tell she's been shot from behind. Such evil fun! Giggles comes with a grassy knoll display base with the HTF logo on the front. It's simple, but it works and gives the figure a little added value. Granted, these figures are still about twice as expensive as they should be, so you should probably hold off until you find a nice clearance sale. Who's your favorite Happy Tree Friend? Tell us on our message board, the Loafing Lounge.